Rosa "William Lobb" ® Description rose "William Lobb" Description David Austin® English Roses. Medium-sized, bushy deciduous shrub, shrub-rose, eventually a climber (H 1,5-2 m, depends also on support, W 1,5-2 m). Branches upright to wide open, thorny. Leaves broadly ovate (10-15 cm), pinnate, 5-lobed, smooth, glossy, green to gray. 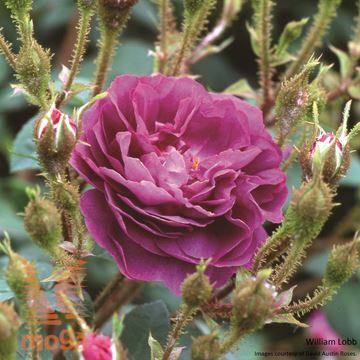 Flowers in clusters, rosette-formed (7 cm), very double, dark purple; fragrant. Flowering period: June-October. Useful mostly as a solitary shrub-rose. A British variety (Austin).